It's a new year, and that means new opportunities. Now that we are in full swing of 2019, we wanted to thank our friends and partners for being in the Digital Projection family. This year is shaping up to be a great one for Digital Projection. Earlier this month, ISE took place in Amsterdam and we were delighted at the opportunity to meet and speak with some of you, while sharing some exciting updates to our products and solutions. As part of our efforts to keep you up-to-date, we hope you will enjoy this bi-monthly newsletter loaded with information. Thank you for your continued support and for working with us to deliver the very best in display solutions! ISE 2019 was a great show for us and for those who stopped by our booth, we want to say thank you! We hope you had the chance to see all of our innovative and powerful solutions for a wide variety of environments. But, if we missed you, let us catch you up on what we had on display. This year, we debuted our new INSIGHT HFR360 Multi-View Projector. 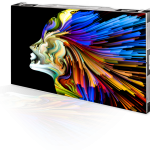 With this Multi-View 3D model, a single projector with ultra-fast frame rates, multiple viewers can experience the display, each with their own perspective relative to their changing positions. This allows the users to see and interact with each other in a truly shared, collaborative manner. Also shown for the first time was an even brighter version of the INSIGHT LASER 8K – the world's first 8K DLP projector. Boasting an even more powerful 36,000 Lumens and crystal clear image detail, the projector’s stunning image quality looks set to 'wow' audiences for a long time to come. 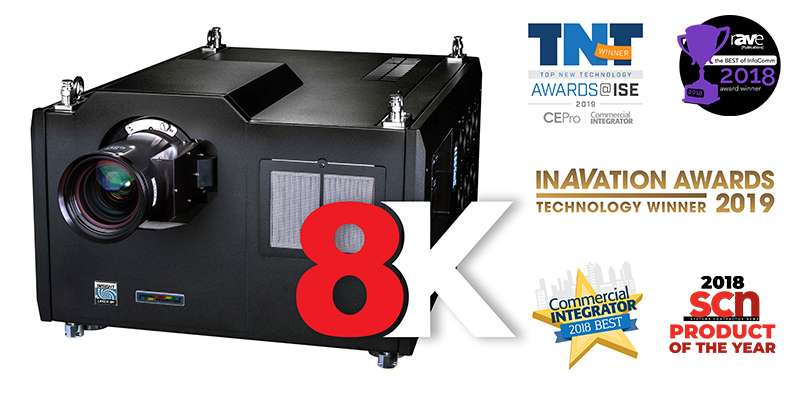 We are also proud to announce that the INSIGHT LASER 8K won two awards at the show; Top New Technology for Large Venue Projectors and Most Innovative Technology for Large Venue Presentation, making the projector the winner of five major industry awards! The new M-Vision 21000 WU and E-Vision 13000 WU both demonstrated their superb color capability with their ColorBoost + Red Laser technology, while the new TITAN projectors, developed specially for the Large Venue and Live Events markets, impressed visitors by creating stunning 4K-UHD images on a 7m screen. Also at the booth, two M-Vision LASER 18Kprojectors were blended to create a stunning dome projection, demonstrating the flexibility that laser projectors bring. Finally, Digital Projection also showcased the expanding Radiance LED product line options from 0.9mm - 4.0mm, offering truly stunning imaging even in the brightest of environments. On display at ISE was a full HD 1.2mm system showing a dynamic range of content and purpose-built application imagery. A new Support page is up and running! A new Support Page is available on our website! At Digital Projection, we pride ourselves on our application support, 24/7 emergency tech support, and turnkey technical service. We also offer comprehensive engineering design support, project consultation, and on-site installation services for our partners, ensuring a truly ‘seamless process’ with our Concierge Service. When you have a question, it’s now even easier to locate the right DP assistance at the click of a button! The Howard Hughes Medical Institute (HHMI) is a science philanthropy, whose mission is to advance basic biomedical research and science education for the benefit of humanity. Named after the successful businessman, film director, and philanthropist, the vision for HHMI was created in the 1940’s among a small group of physicians and scientists that advised Mr. Hughes. 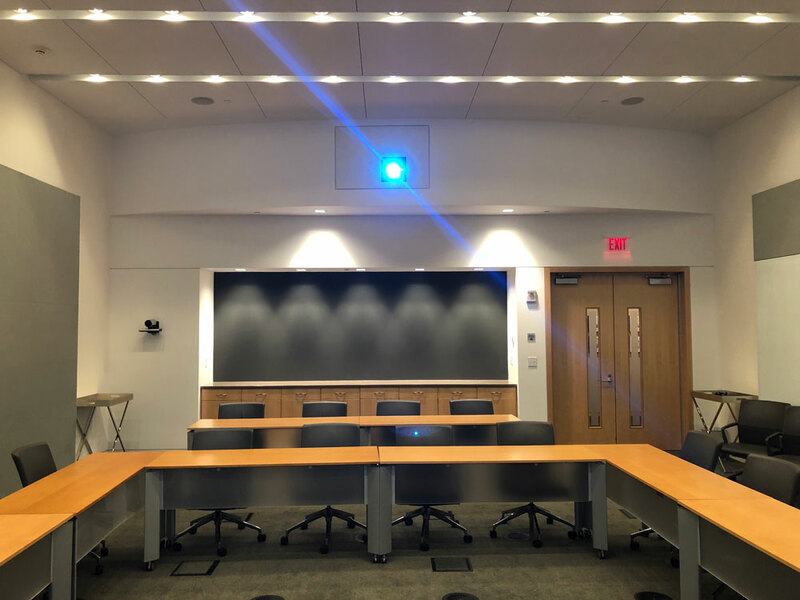 Digital Projection is proud to be a part of this endeavor with projectors that can provide the level of image detail required by top level research scientists. The Institute selected the INSIGHT 4K projector for their Seminar Auditorium. The decision was based on full 4K resolution, accurate color reproduction, and high brightness to light up the large screen. They have also been very pleased with the level of Concierge Support that is included with every INSIGHT projector. The Seminar Room is where some of the greatest minds in the world come together to review the latest discoveries in the medical field. These scientists require their critical research to be displayed in full detail. HHMI focuses on five areas of research including cell biology, genetics, immunology, neuroscience, and structural biology. The INSIGHT 4K projector was compared to several other products and determined to be the very best for reproducing the images required by the scientists. Digital Projection's support was also instrumental in the completion of the project with thorough design and calibration for the INSIGHT 4K. 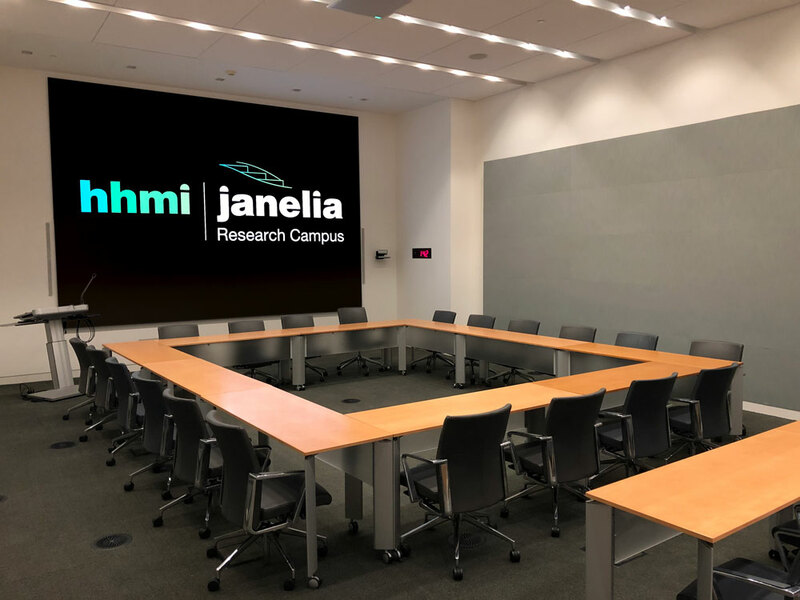 Of course, not everything is work at HHMI; they also like to use the Seminar Room for fun events that include movies shown in 3D and even karaoke competitions, which the INSIGHT projector supports with fantastic images. 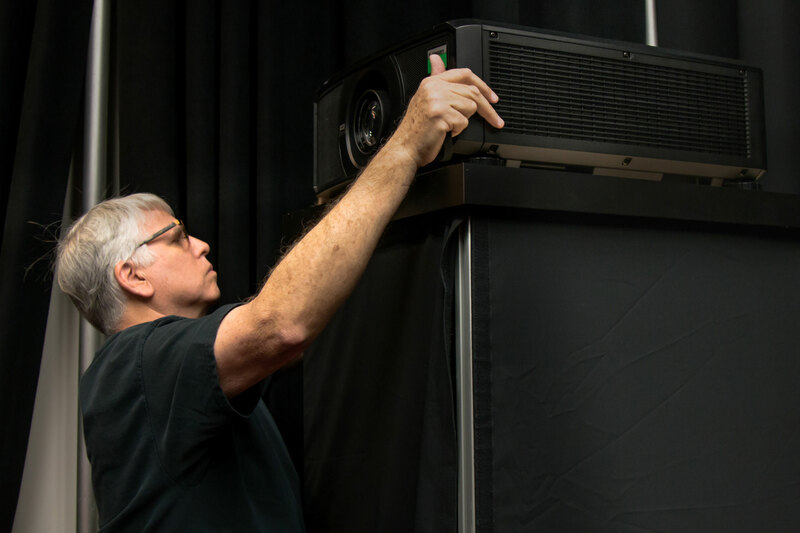 As today’s projection technology continues to advance, updates, enhancements, and modifications have all added to the many options available to the user. Through precision and craftsmanship, a diversity of lenses allows projectors to serve as flexible solutions for a wide variety of applications. So exactly how do you choose the perfect lens for every application? With any two of these values, the third can be calculated. By taking a few minutes to gather this information, you can assure your first installation is a correct installation. Screen Width: The dimension used in throw ratio calculations is always the width of screen (never the screen diagonal). Throw Distance: Always measured from the front center of the lens to the first perpendicular point of contact on the screen. Although these calculations are simple and straightforward, it is easy to make a measurement or calculation mistake that could lead to the incorrect lens being selected. The most common mistake is when the lens ratio is rounded up or down. The rule of not rounding values applies to all calculations; weather your calculating screen sizes, throw distances, or throw ratios; it is always best to take accurate measurements. 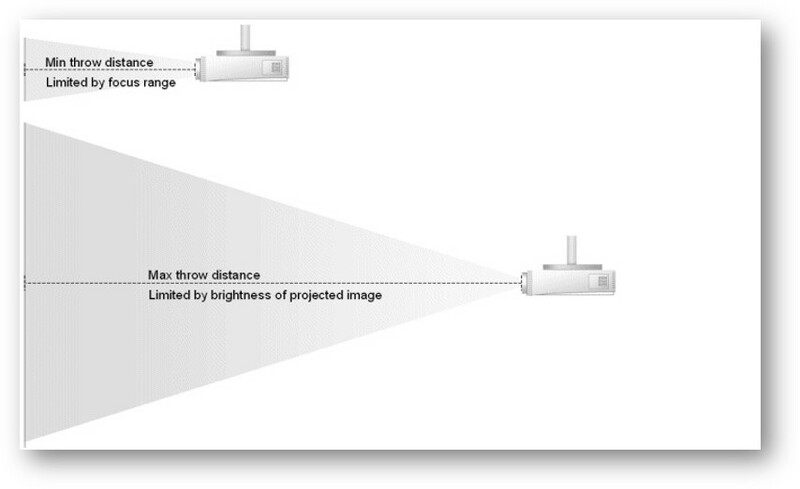 To add an extra measure of installation security, we recommend projectors not be located such that the lens is at either extreme of its throw ratios. Choose the lens that has the most flexibility on both sides of the required Throw Ratio. If the required throw ratio is at the extreme range of the lens, then adjust throw distance or screen size accordingly. Have a question or just want to be sure you have chosen the perfect lens fit? Call on Digital Projection's Application Support team; that's what we are here for! Specializing in pre-and post-sales and installation questions and support on items such as product selection, lens options, projector setup/operation, and more. Featured this month in our ILLUMINATE series is Digital Projection’s 1.2mm Radiance LED video wall solution. As one of the most popular resolution choices in our Radiance product line, our 1.2mm option allows excellent image quality from very close viewing distances. 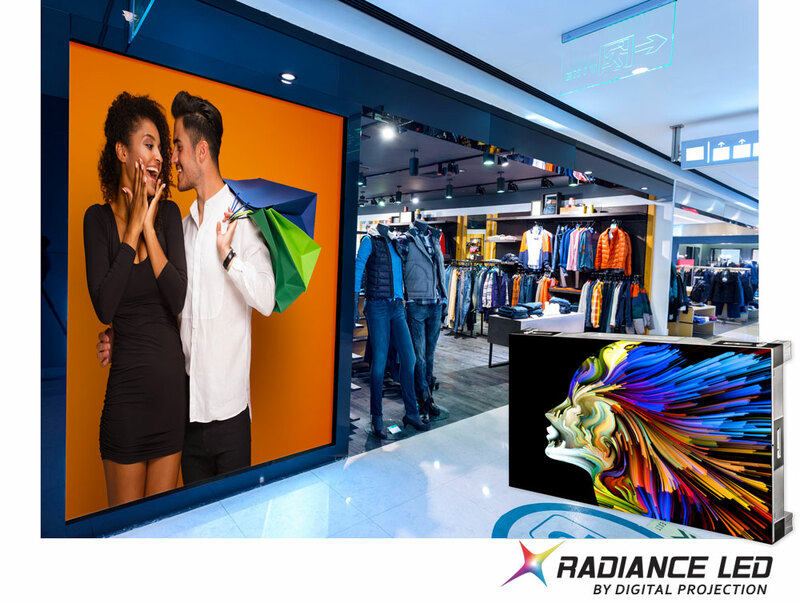 With a native 1.78 aspect ratio panel design, and over 129,000 pixels per panel, Radiance LED 1.2mm quickly assembles into high resolution displays. In a 4W x 4H configuration, our customers enjoy pixel-perfect full HD resolution at an impressive 110” diagonal size. This configuration is rapidly becoming a standardized display choice for executive board rooms, briefing centers, training rooms, and common areas. At first glance, Radiance 1.2mm displays immediately capture attention with their seamless configuration, dynamic color and contrast, and sleek, no-bezel appeal. 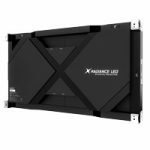 For easiest configuration and deployment, Digital Projection offers our Radiance 1.2mm panels as system packages: HD at 110” diagonal, UHD at 220” diagonal, and even a popular “Ultra-wide” aspect ratio 2x 1080p. Our system packages come complete with all LED panels, electronics and mounting hardware to easily integrate the display into your environment. For custom projects, Digital Projection’s team of application engineers and solutions specialists can help you design the perfect LED solution to fit your needs. 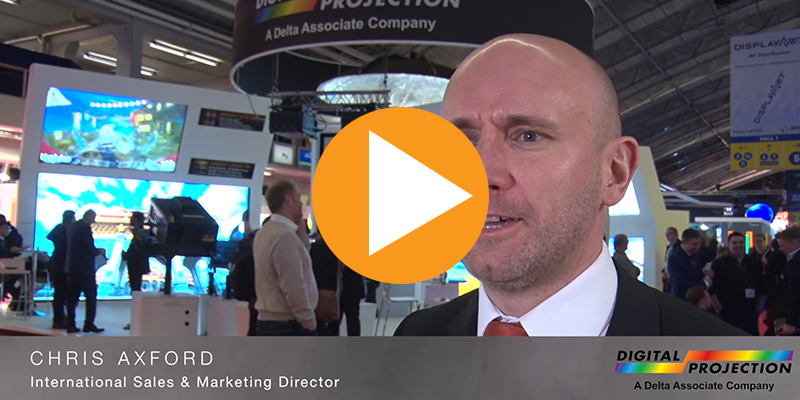 Want to know more about Radiance LED by Digital Projection? 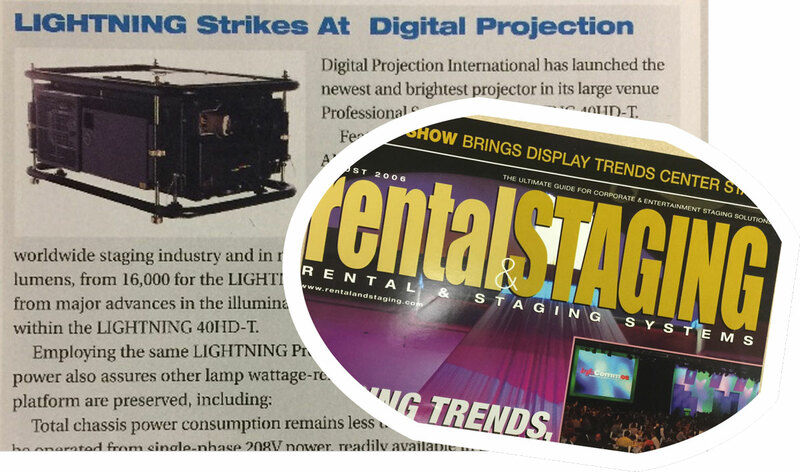 A mere 13 years ago, Digital Projection was celebrating the LIGHTNING 40HD-T. Thundering in with 21,000 lumens, 2K resolution, and a consistent lamp life, this was THE projector for anyone serious about rental and staging! LIGHTNING no longer strikes at Digital Projection, as this family of lamp-based projectors has been officially retired. But, fear not! Digital Projection carries on the legacy by continuing to deliver the very best in projection for our rental and staging partners. Today, we have the Ultra-Powerful Laser Titan 37000 WUXGA. This is the class-leading 3-Chip DLP Projector, offering up to 37,000 lumens, 4K-UHD resolution, and is completely laser illuminated!